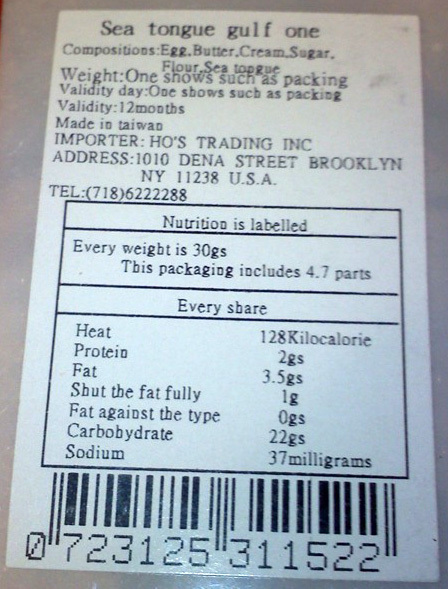 Language Log » "Shut the fat fully"
Scans of the front and back of the package are shown below. It's pretty easy to figure out how the translator arrived at "the fat fully", but the "shut" part is a little bit more challenging. The usual way to write "saturated fat" in Chinese is bǎohé zhīfáng 饱和脂肪, where bǎohé 饱和 is a disyllabic term meaning "saturated" and zhīfáng 脂肪 is a disyllabic word meaning "fat". It's hard to mess up with zhīfáng 脂肪 ("fat") because both characters used to write it have the "flesh" radical, the phonology is straightforward, and it's a very common word. In contrast, bǎohé 饱和 looks simple enough, and its first syllable, bǎo 饱 ("full") is a piece of cake; e.g., wǒ chī bǎole 我吃饱了 ("I've eaten my fill; I'm full"). But when we look more closely at hé 和, the seemingly innocent second syllable of bǎohé 饱和 ("saturated"), all hell breaks loose. This is disappointing, since — despite the plethora of meanings for hé /hè / huó / huò / hú 和 — "shut" is not to be found among them. We have to look elsewhere. An exact homophone of hé 和 is hé 合. The fact that they both sound the same, have relatively few strokes (8 and 6 respectively), and incorporate the 口 component lead people to frequently confuse them. Enough on "shut the fat fully". The next item on the label, "fat against the type", may be disposed of much more quickly. In this position on a food label, we would expect "trans fat". Now, the usual Chinese translation of "trans fat" is fǎnshì zhīfáng 反式脂肪. We are already familiar with zhīfáng 脂肪 ("fat"), so we only need concern ourselves with fǎnshì 反式. Individually, fǎn 反 means "reverse, opposite, against, contrary to", etc. and shì 式 means "type, style, form, pattern", and so forth. Together, as fǎnshì 反式, this is the term that Chinese chemists have chosen to render "trans". The translation error here, "fat against the type", is the result of taking each syllable separately instead of treating them as parts of a disyllabic prefix signifying the relationship of identical atoms on opposite sides of a double bond in a chemical compound. There are other infelicities and errors on the nutrition label, but I think I've done my part in explaining the fatty ones. Since the product is from Taiwan, it's worth adding the pronunciation hàn, commonly used in Taiwanese Mandarin for 和 in the sense of "and." The same character is also used as a shorthand for Japan/Japanese (pronounced wa in Japanese). Which leads to the joke that in Taiwan a Japanese-Chinese dictionary (和漢辭典) is a Hàn-Hàn dictionary (Hàn 漢 being the shorthand for Chinese). These labels are always hilarious. I do not know any chinese, but couldn't "shut the fat fully" simply (or also) come from the chemical definition rather than a linguistic description? Very briefly, in organic chemistry saturation means that every carbon atom in a chain is attached to as many hydrogen atoms as it can take, i.e. there are no double bonds, or any "open links" left "available" to bond, so it's ingenious and not inaccurate to say that saturated fat is "fully shut." Hmm. "Sea tongue" remains opaque to me. I would be concerned, if offered this product, as to what "Sea tongue" might be exactly if it's not in fact an exotic ingredient best translated as "Sea tongue". I would also be worried by "One shows such as packing" which I take to mean roughly "See elsewhere on the pack" when I cannot discover (perhaps my error?) any date marking that would enable me to be sure if these were still good. This example goes to two things, firstly, the rule (found in the EU and presumably also the US) that importers must relabel or repackage imported goods if necessary in order to render them compliant with local rules, and must identify themselves clearly as responsible for compliance, is effective only if the distributors not only make a good faith effort to comply but also understand the local language well enough to know when they're falling down. And secondly, previously lamented here on Language Log, it's a shame that when there are so many fluent English users around (in most parts of the world, but certainly in Brooklyn) nobody bothers to consult one when attempting this sort of translation. "Dena Street Brooklyn" caught my eye: a misspelling of Dean Street. Thank you, Victor, for another fascinating, educating, and entertaining exegesis. @Nick: The cookies contain some dark flecks I suspect (hope!) are seaweed, and the small Pringles-y shape might be described as tongue-like, if less so than the famous French treat, langues de chat. This doesn't explain why "sea tongue" would be listed as an ingredient, though. I don't doubt any of the rest of the listed ingredients. The funny phrases here make me think the nutrition label was produced in Taiwan, not in Brooklyn. There's no Chinese nutrition facts information under the "English" label, but maybe the factory stocks labels in a variety of "languages," applying them as appropriate for the export destination. @Victor: In these parts, 金门超市 calls itself Kam Man Food. There are a half dozen Kam Man stores (Kam Men?) in NJ, NY, and MA, which contain no shortage of linguistic goodies. As for the error of 饱合, Google Translate, perhaps because of the ghit count, goes with "saturation" (and providing both "saturated" and "unsaturated" as click-for alternatives), but offers "Did you mean: 饱和" (and as Google always does, without a question mark). Sea tongue could itself be seaweed. Some seaweed leaves are quite tongue-like. Ah, then, they are probably using conventional romanizations of Cantonese for 金门: gam1 mun4. Of course, that would make sense for the places you mention, since they have traditionally been filled mainly with Cantonese-speaking immigrants. Nick's comment made me think of the German word for sole (fish): Seezunge, literally "sea tongue." Now Rachael comes along with a seaweed reference and describes the stuff as (often) tongue-like. German for seaweed: Seetang, which sounds enough like "sea tongue" to set my head spinning. Didja hear the one about the German-Chinese restaurant? A quick Google reveals that "Sea Tongue" is a pan-Asian translation service (ironically) and Gulf One is a bank in Bahrain. Alternatively sea tongue is apparently how Thai people refer to a certain kind of cuttlefish. But why, when you put them together, do you get something that looks like a fortune cookie without the fortune? These are a kind of seaweed flavored cookie. 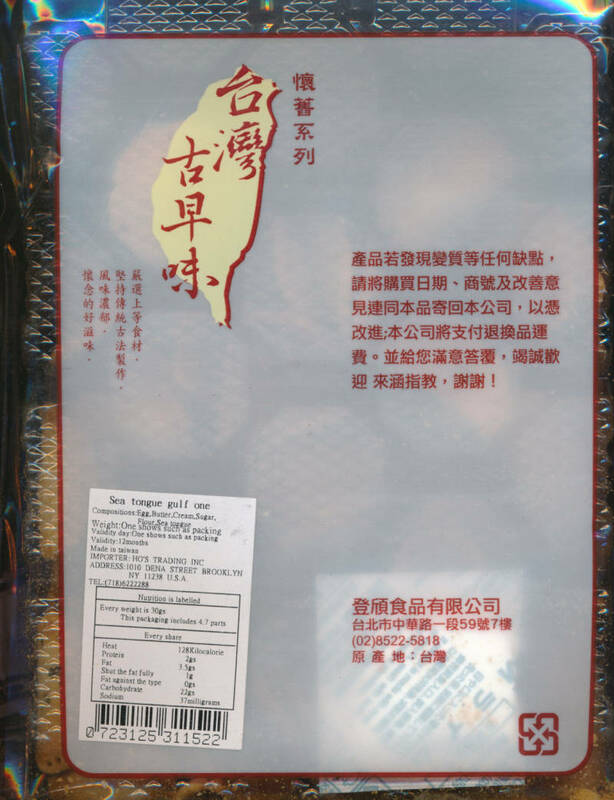 This kind of seaweed is known as 海苔 hǎi​tái. 海 means sea, but if you look up ​苔 on its own, you find when pronounced tāi​, it's defined as "coating (of tongue)". 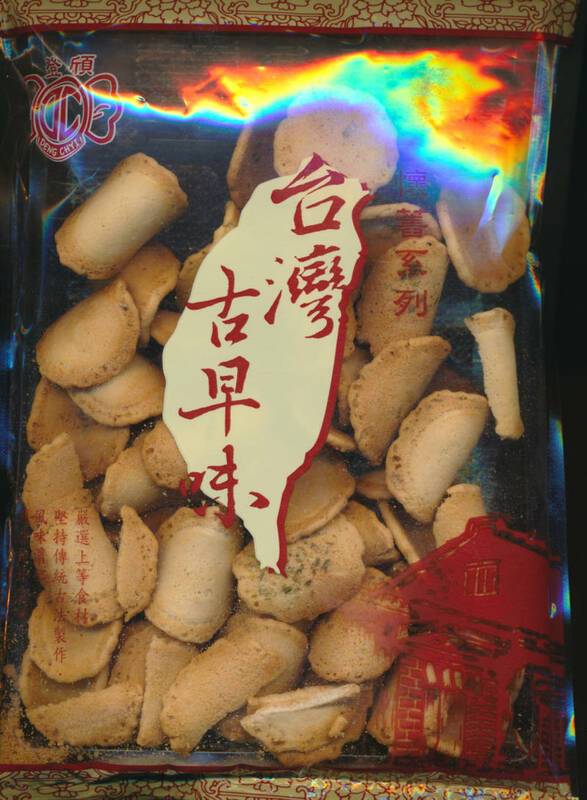 @hanmeng, can you shed any light on why the cookie is called "sea tongue gulf one"? Something no one's commented on yet, but that I find VERY interesting, is the use of "heat" to signify calories. This is technically correct, and in fact is a much more useful descriptor than "calories," which is more or less just repeating the unit of measurement, but I have never seen this on any untranslated English-language packaging. In fact, I'm not even entirely sure that most English-speakers would recognize and understand this usage of the word "heat," which is essentially rating the amount of energy extractable from the digestible mass of the food. Of course, heat is far from the only kind of energy (and in fact the digestive system mostly does not utilize food calories to produce heat), but this is a very simple and very logical conflation to make. @Lauren: Heat may come from the first character of 热量 (literally heat content), which may be a technical word for calorie. One of my Pleco dictionaries gives 热量计 for calorimeter. hanmeng's comment is helpful for understanding how this product got its name. I'd like to point out, moreover, that ​tái 苔 in the second tone signifies "moss; liverwort". Obviously tái 苔 and tāi​ 苔 are cognate. The grass radical of 苔 reminds us that tái 苔 ("moss") is a plant and tāi​ 苔 is plant-like ("tongue-moss", as it were). @Lauren, not only that, but the packaging refers to kilocalories, which is the correct unit, as opposed to "calories", which is the usual term in American nutritional labels. Well, often "Calorie" is capitalized when it's for kilocalorie, and lowercase for a scientific calorie. But I don't think many people actually distinguish between the two; this 'rule' might just come from the fact that words in a nutritional label are usually capitalized, because it's a label. For what it's worth, this nutrition facts label is flagrantly noncompliant with FDA rules regarding such labels. Search Google for "Nutrition Facts label" to see that the rules are quite strict about what such labels may and must say. It's surprising to me that such packages are sold openly in the U.S.